Remaining seated can be so pleasant The intelligently designed nox bench allows you to take up a variety of positions. But you will always sit comfortably, whether upright or relaxed. The upholstered leather cover incorporated over the full area makes the bench comfortable. A range of 23 leather colours includes one for every taste. In terms of workmanship, the nox bench stands out through such loving details as the elegant S-lines at the corners. These harmonious lines are also repeated in the upholstered leather backrest. 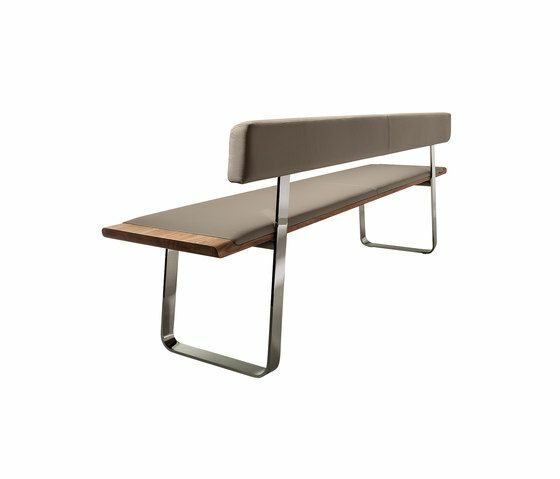 The nox bench is alternatively available with upholstered leather backrest. For the legs, you can choose between wooden panels and metal slides in gloss or matte chrome-plated steel or in gloss palladium.